We are half way there! Please donate now so that we can reach our goal! 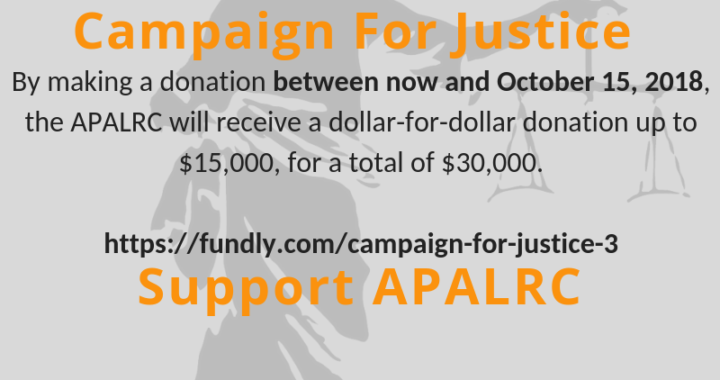 APALRC has extended the Campaign for Justice to the end of the month. By making a donation between now and October 31, 2018, the APALRC will receive a dollar-for-dollar match up to $15,000. 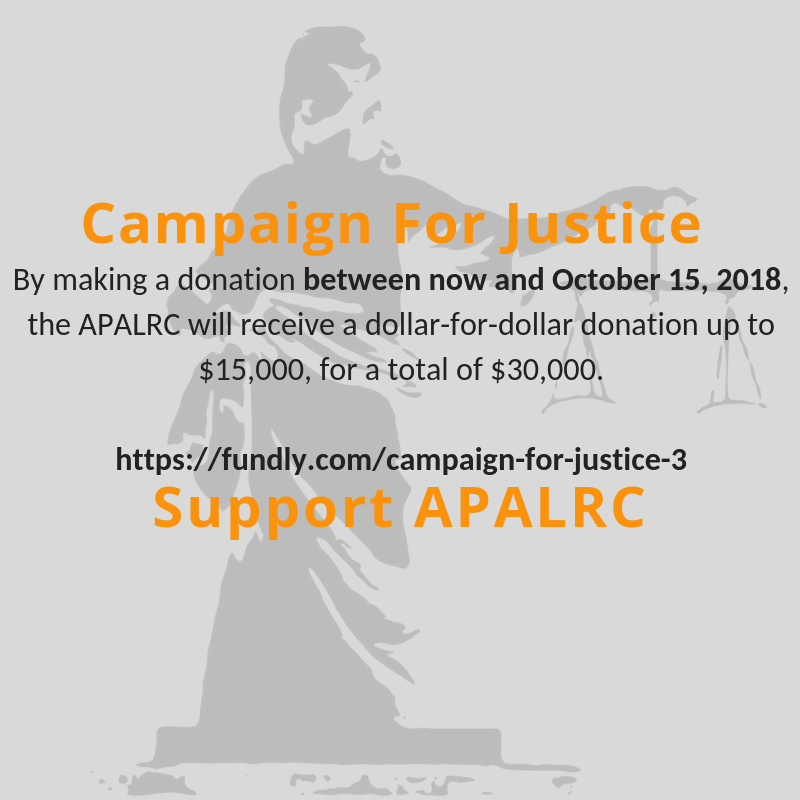 We hope you will donate today so that the APALRC can continue to provide much needed civil legal services to the Asian Pacific Islander community. 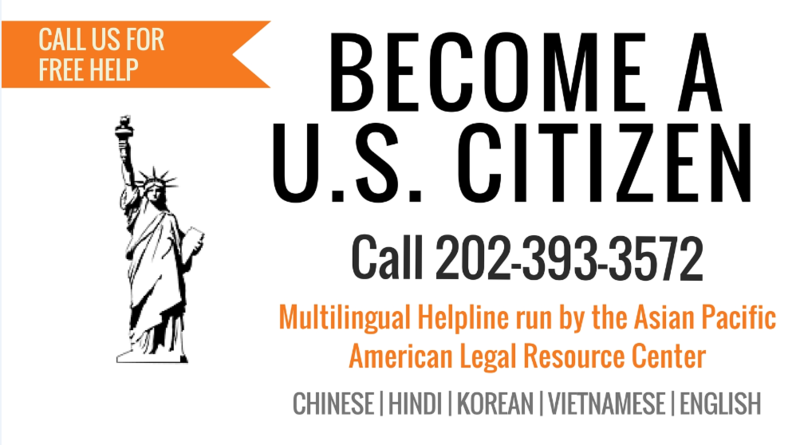 The APALRC is proud to join the American Immigration Lawyers Associate (AILA)’s 12th Annual Citizenship Day event on Saturday, September 15, 2018. 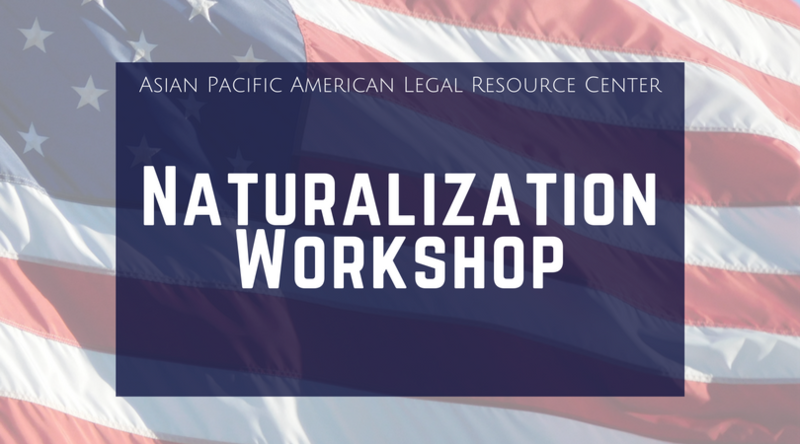 The APALRC legal team and trained volunteers will assist participants with completing their naturalization applications (Form N-400) Saturday, September 15th from 10:00-2:00 at George Mason Regional Library, 7001 Little River Turnpike, Annandale, VA 22003. 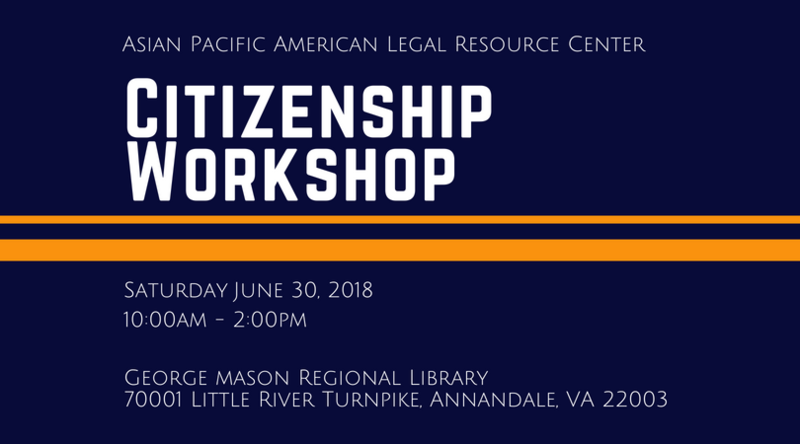 The APALRC legal team and trained volunteers will assist participants with completing their naturalization applications (Form N-400) June 30 from 10:00-2:00 at the George Mason Regional Library, 7001 Little River Tpke, Annandale, Virginia 22003. 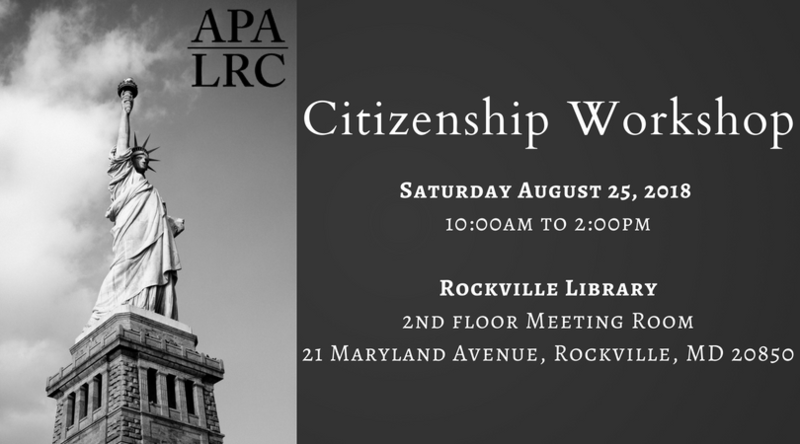 The APALRC legal team and trained volunteers will assist participants with completing their naturalization applications (Form N-400) June 9 from 10:00-2:00 at the Rockville Library at 21 Maryland Avenue Rockville, MD 20850. 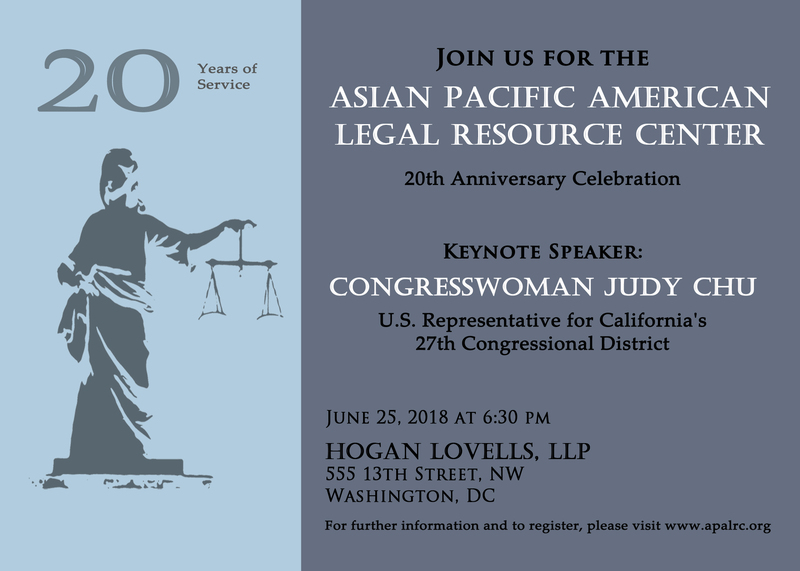 This year the Asian Pacific American Legal Resource Center will be celebrating its 20th Anniversary on Monday, June 25, 2018 at Hogan Lovells, LLP in Washington, DC. 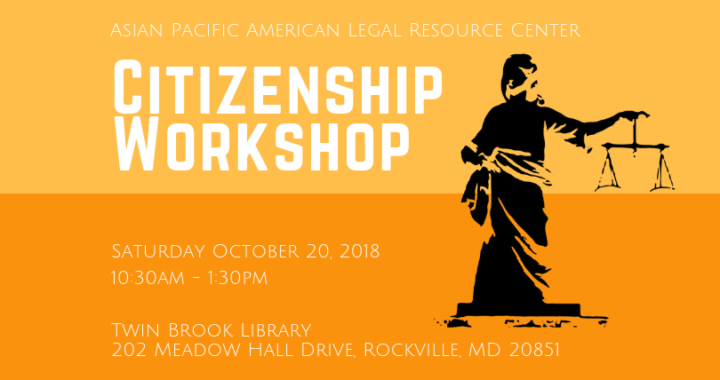 We hope you will join us as we celebrate the APALRC’s founders, who recognized how our organization could provide access to critical legal services for the low-income Asian American Pacific Islander community residing in the D.C. metropolitan area. We are also honored to have Congresswoman Judy Chu, U.S. representative for California’s 27th Congressional District, as our keynote speaker – a tireless advocate and leading voice on issues of importance to our community. 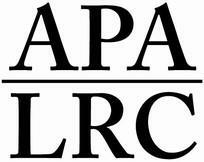 Please click here to register for the APALRC’s 20th Anniversary. 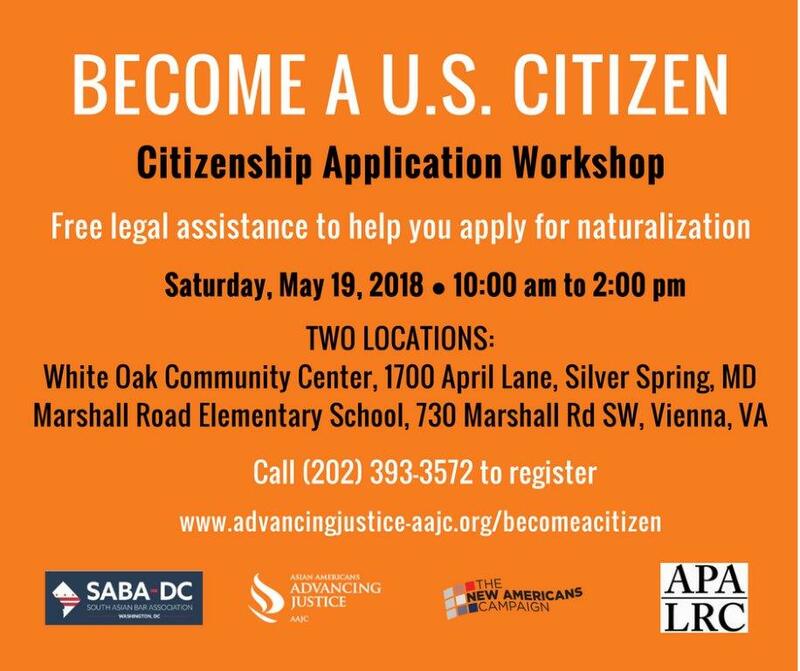 The APALRC legal team in partnership with the South Asian Bar Association of D.C. and Asian Americans Advancing Justice|AAJC will assist participants with completing their naturalization applications (Form N-400) on May 19, 2018 from 10:00-2:00 at 2 locations – White Oak Community Center in Silver Spring, Maryland and Marshall Road Elementary School in Vienna, Virginia.